Traditional to Asian cuisine, kelp noodles are most commonly found in Korean cooking, where the light taste and springy texture of the noodles take well to the rich and fragrant sauces of the cuisine. Made from a brown seaweed that grows in deep waters, kelp noodles can be purchased in Asian grocery stores and some health food stores. Like all kelp and kelp products, they are safe for human consumption. 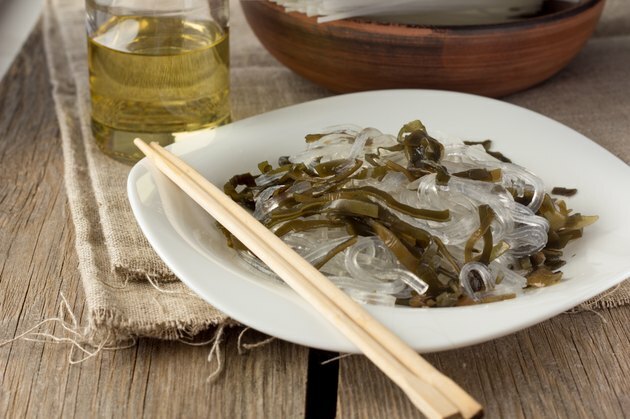 To make kelp noodles at home, you need to purchase dried or raw kelp, also known as kombu, grind it into a flour or paste and mix with fresh water and salt. The gummy compounds in kelp help the noodles achieve their springy texture. It takes 1 cup of fresh kelp to make a 1/2 cup serving of kelp noodles. Kelp noodles are rich in a number of nutrients, namely calcium, iron and vitamin K, especially given the small serving size of noodles. A 1/2 cup serving of kelp noodles has 134 milligrams of calcium, 11 to 13 percent of the recommended dietary intake; 2.28 milligrams of iron, 12.6 to 28.5 percent of the recommended dietary intake; and 52.8 micrograms of vitamin K, 44 to 59 percent of the daily adequate intake. A 1/2 cup serving of kelp noodles has 1 gram of dietary fiber, a good quantity given the small serving size. Kelp noodles can help you meet the 25 to 38 grams of dietary fiber recommended per day. A diet high in fiber reduces your chances of heart disease and can help relieve symptoms of constipation and diverticulosis. Dietary fiber also adds bulk to your diet, making you feel fuller on fewer calories, reducing the risk of overeating. Most Americans, according to Colorado State University Extension, do not include enough dietary fiber content in their diet. Compared to other noodle choices, such as spaghetti, kelp noodles can help with weight loss. A 1/2 cup serving of kelp noodles has 34 calories per serving and less than half a gram of fat. A 1/2-cup serving of cooked, enriched spaghetti has 111 calories per serving and a little more than half a gram of fat. Substituting kelp noodles for spaghetti means a calorie deficit of 77 calories. Using kelp noodles in place of spaghetti even just twice a week for a year could help you lose over 2 pounds of body weight. Kelp noodles are naturally high in sodium. A 1/2 cup of homemade kelp noodles has 186 milligrams of sodium, and, if you use one-eighth teaspoon of added salt to make your noodles, that is an additional 250 milligrams of sodium. A diet high in sodium can increase your risk of heart disease, and most Americans already have a diet that is too high in sodium. The recommended intake is a maximum of 1,500 milligrams for people with a history of heart disease, who are African-American or who are over the age of 50. For all others, the recommended maximum intake is 2,300 milligrams per day. To keep your kelp noodles as low as possible in sodium, do not use added salt. If you buy dried kelp, soak the seaweed until it is supple before making the noodles, throwing away the soaking liquid to further reduce the amount of sodium in your noodles. University of Southern California: Helpw With Kelp -- Humans -- Yes!